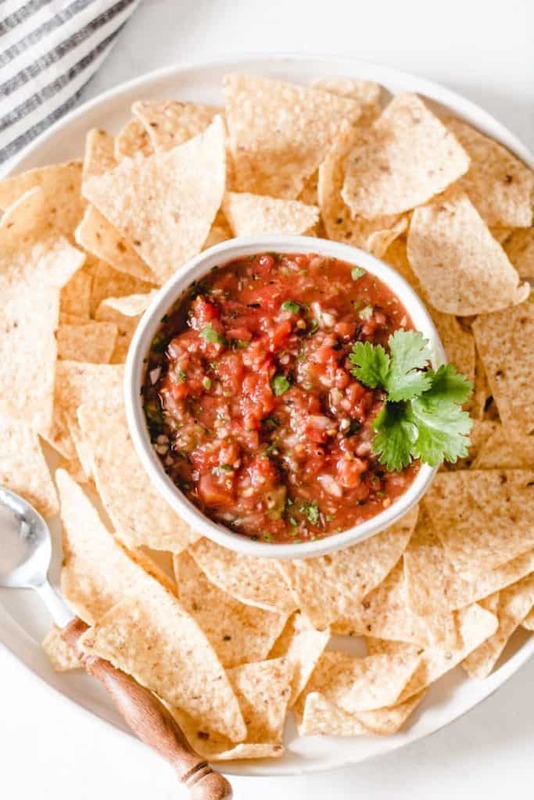 Restaurant-Style Chipotle Salsa comes together in as little as five minutes! Fresh and spicy, sure to be your new favorite salsa! 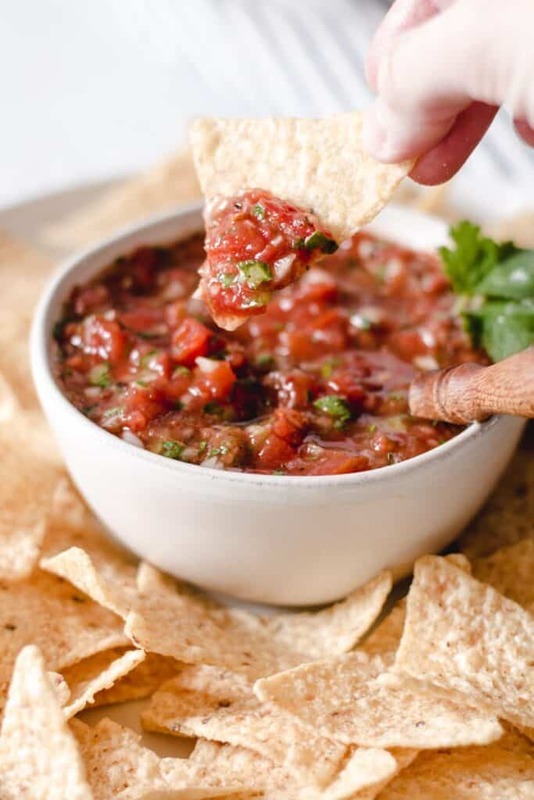 I’ve been making this quick and easy restaurant-style chipotle salsa for quite a while. It all started with this version of the salsa, but one day I added chipotle peppers and I haven’t looked back. I always seem to have a little jar of these chipotles in my fridge. They’re just so good in everything from tacos to chili, and well, this salsa. I’m telling you, once you fall in love with that little can of chipotle peppers in adobo, there’s no way out. You start putting them in everything! Side note: did you know a chipotle pepper is just a dried jalapeño? I bet you didn’t! The star of this show, much to the chagrin of the chipotles, is canned tomatoes. That’s the base for this salsa and also what makes it so easy and so accessible! You don’t have to wait until those beautiful ripe tomatoes are bursting from your garden to have fresh salsa. I always opt for fire-roasted diced tomatoes. They add an extra layer of flavor that I really like, especially since this salsa isn’t cooked. onion, the sweeter the better. jalapeno pepper, remove the seeds! Or don’t, but I do. fresh lime juice from an actual lime. Please and thank you. and cilantro, unless you think it tastes like soap. Lucky for me, it doesn’t! Chipotle Peppers in Adobo Sauce! These guys are seriously one of the most underrated ingredients. Period. 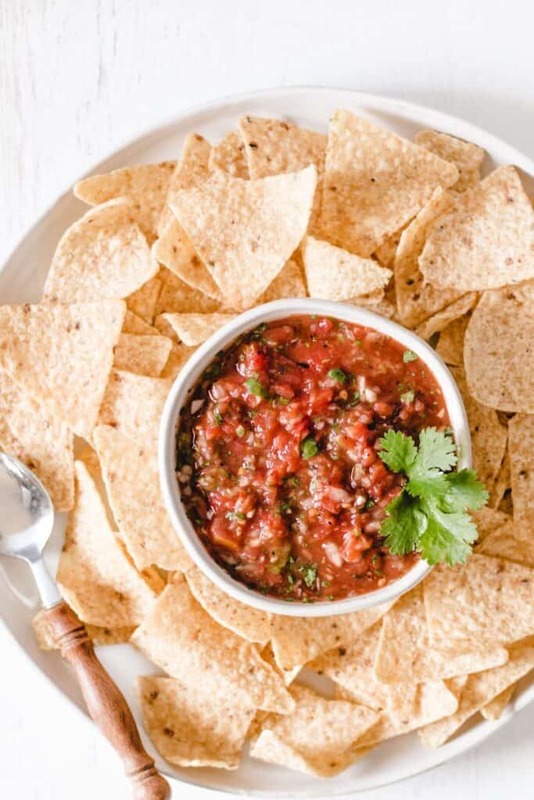 If you’ve never used them, then just trust me and try them in this salsa. They can be spicy, BUT you can tame them down by removing the seeds! With a sharp knife, cut a slit lengthwise in the pepper and open it up. You’ll likely see a bunch of seeds. Use the back of the knife to scrape them out. Then use the remaining flesh of the pepper in the salsa. To store the leftover chipotle peppers in adobo: keep them in a jar in the fridge. They will last for weeks! Toss them in your cooking wherever you need a little smoky, spicy flavor! 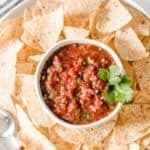 I make this salsa in my food processor (affiliate link). Admittedly, I’m a crazy foodie that’s always in the kitchen. I use my Cuisinart Food Processor (affiliate link) all the time so it lives on my counter. I know that’s not normal. You might not have a food processor or like lugging it out. In that case, you could use a blender or just chop everything up by hand. The salsa will be delicious no matter the method. 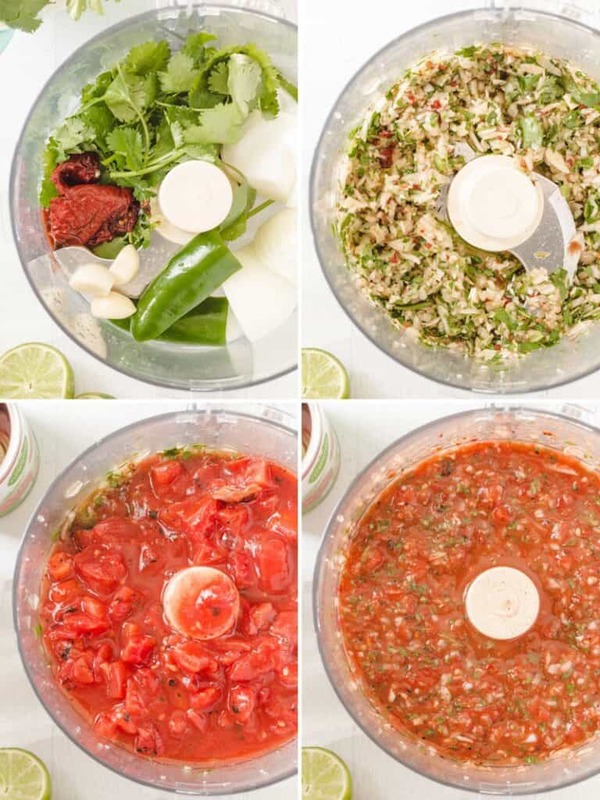 The food processor, though, is what makes this salsa come together so quickly and easily! To make this 5 minute salsa, first put everything but the tomatoes in the food processor and pulse a few times. Then dump in the tomatoes and pulse a couple more times. That’s it! It really is that quick and that easy. I find that this salsa will last 3-5 days in the refrigerator. I just keep it in a mason jar with a lid! Let me know how you like this salsa! I am confident you’ll love it! 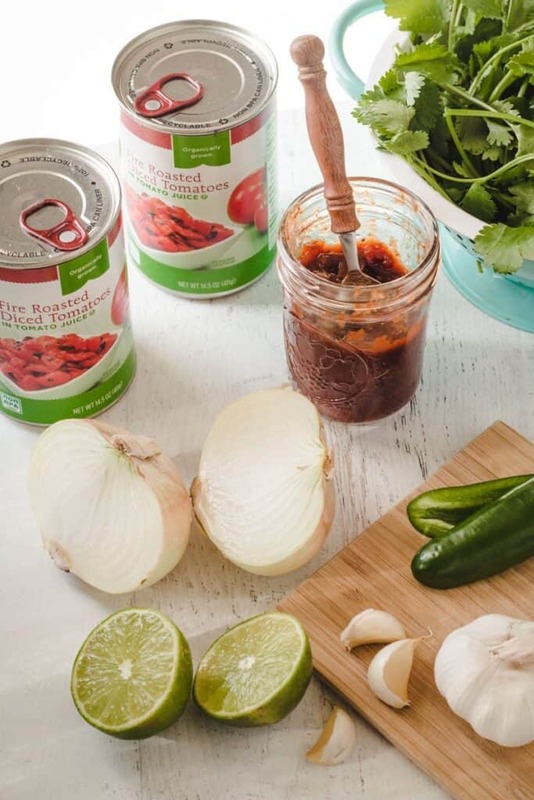 All you need is five minutes and a few ingredients to make fresh and spicy restaurant style chipotle salsa! Put all ingredients except the tomatoes into the bowl of a food processor. Pulse a few times until the ingredients are chopped. Add in the tomatoes and pulse a few more times. Refrigerate until serving. 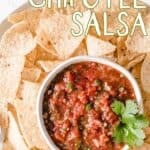 I’ve made your salsa many times, but haven’t tried this recipe with the chipotle peppers. I’ll put them on my list. And, no, I didn’t know they are dried jalapeños! Great post!